University Communications is highlighting a few members of the Class of 2018. See more commencement news at rit.edu/news/commencement. 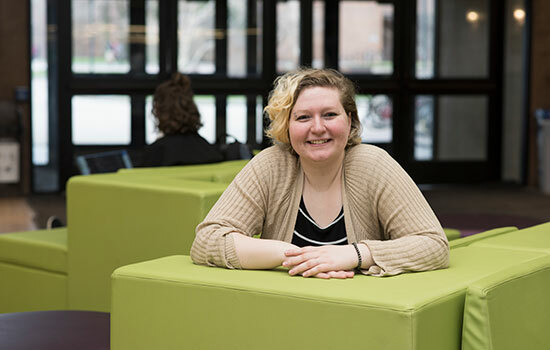 When Elizabeth Sheffield crosses the stage at graduation, she’ll do so wearing a special stole that exemplifies her heritage, hard work and the tremendous support she has received from her Native American tribe during her four years at RIT. Sheffield, a fourth-year animation student in the School of Film and Animation at the College of Imaging Arts and Sciences, is a proud citizen of the Chickasaw Nation and will be wearing a special stole that reads Chikasha Holitoplichi, meaning Honors Program. Sheffield said the “overwhelming support” from the tribe has included financial assistance for scholarships, clothing, textbooks and, most recently, partial reimbursement for graduation expenses. That support, she said, has nicely complemented the welcoming environment she has experienced since walking onto the RIT campus. “I made a couple of friends that, as a freshman, I felt made the adjustment period much smoother for me,” she recalled. Sheffield has been accepted into the Chickasaw Nation Internship Program as a multimedia intern after graduation. The 10-week program will take her to the Chickasaw Nation’s home base in Ada, Okla., where she is looking forward to proving herself during her internship. She hopes to be hired permanently at their location in Washington, D.C., where she would be closer to her family and friends. Sheffield is looking at the opportunity for both important experience early in her career and to help payback the Chickasaw Nation for the tribe’s belief and support in her. WXXI’s “Connections” program features Nana-Yaw Andoh, assistant professor of architecture.